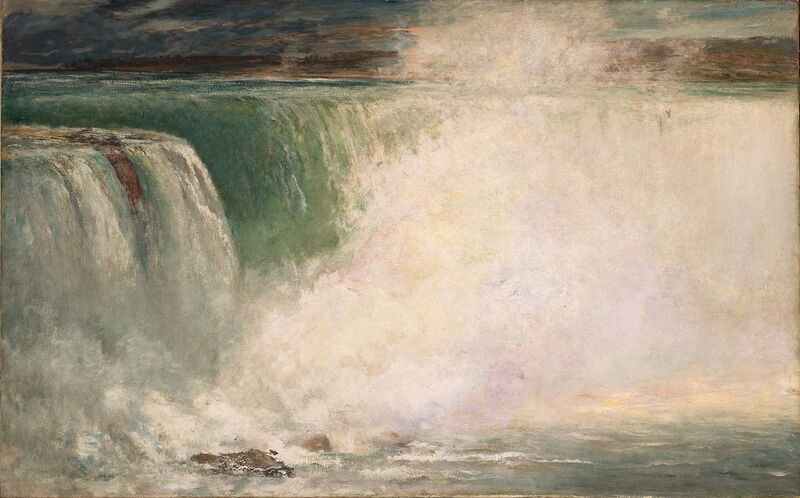 William Morris Hunt (1824–1879), Niagara Falls (1878), oil on canvas, 158 cm x 252 cm, Williams College Museum of Art, Williamstown, MA. Wikimedia Commons. When William Merritt Chase moved into his new Tenth Street Studio in 1878, he took over the prime studio area in what was almost certainly the first purpose-designed building for visual artists in North America. Its architect was Richard Morris Hunt (1827-1895), who remains a pre-eminent figure in American architecture. Among his many other designs were the New York Tribune Building, William K Vanderbilt House, Marble House (Newport, RI), the Fifth Avenue facade of the Metropolitan Museum of Art, and the pedestal for the Statue of Liberty. Hunt’s brother, William Morris Hunt (1824–1879) must have been a key influence over the design of the building, as he was the major painter in Boston at the time. He also had the distinction of being one of the few painters of the Barbizon School outside France. William Morris Hunt was born in Brattleboro, Vermont, into one of the state’s wealthy and artistic families. His father was a Congressman, but died young. His widow decided to take their children with her to Europe, where they would be able to learn to draw and paint in the best academies. The family travelled through Switzerland, the south of France, and Rome, before Richard and William settled in Paris, as students. William had originally intended to be a sculptor, and had already been a student in Düsseldorf from 1845-6. Then, while Richard attended the École des Beaux-Arts in Paris studying architecture (the first American to do so), brother William attended it to study painting under Thomas Couture, until 1852. William Morris Hunt became great friends with Jean-François Millet, and from him learned the style of the Barbizon School. William Morris Hunt (1824–1879), Girl at the Fountain (1852–54), oil on canvas, 116.8 × 90.2 cm, The Metropolitan Museum of Art, New York, NY. Wikimedia Commons. 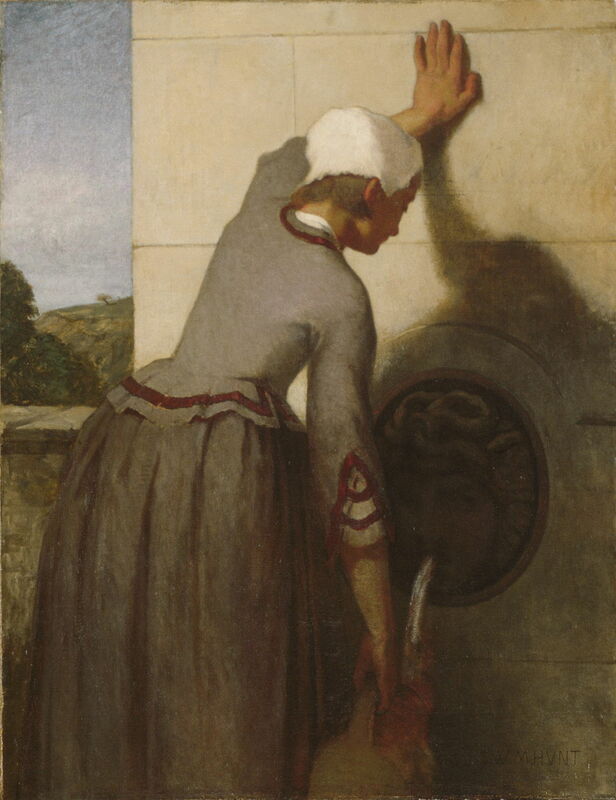 Hunt painted Girl at the Fountain (1852–54), when he was learning the Barbizon style with Millet, near Paris. This painting was clearly not one which had any influence from Millet, and may date from his time with Couture instead. After leaving Paris, Hunt returned via Newport, RI, Brattleboro, Faial Island in the Azores, and finally settled in Boston in 1855. His early paintings in Boston were mainly portraits, but tragically many of his paintings, drawings, and five large paintings by Millet which he owned, were all destroyed in the Great Boston Fire in 1872. William Morris Hunt (1824–1879), The Listeners (c 1859), oil on canvas, 62 x 51.1 cm, Private collection. Wikimedia Commons. 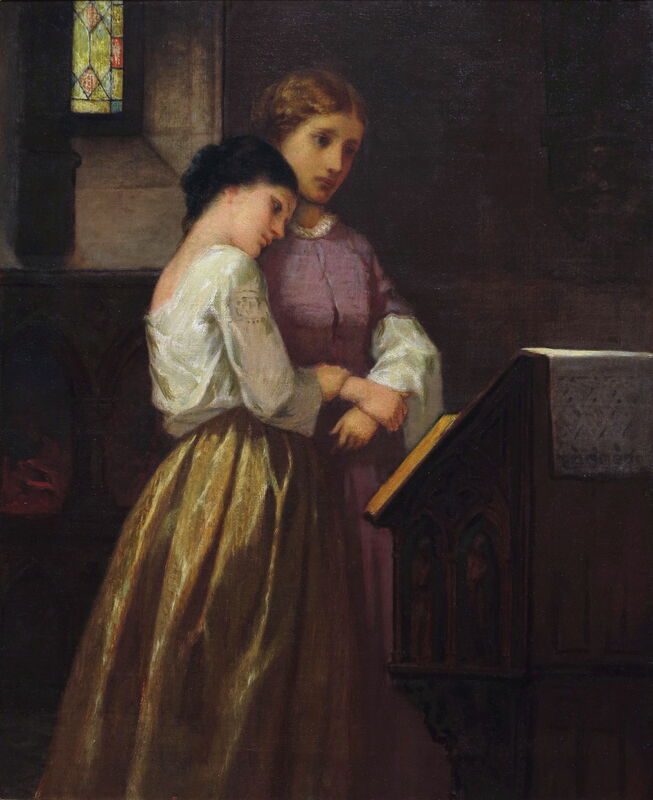 The Listeners (c 1859) appears more typical of a British Victorian piece from that time, but includes a fine study of the interlocked hands of the two women. Hunt’s portraiture practice rapidly became very successful, with all the wealthiest Bostonians – known as Boston Brahmins – wanting him to paint them. He was also a prolific print-maker, and sculptor. 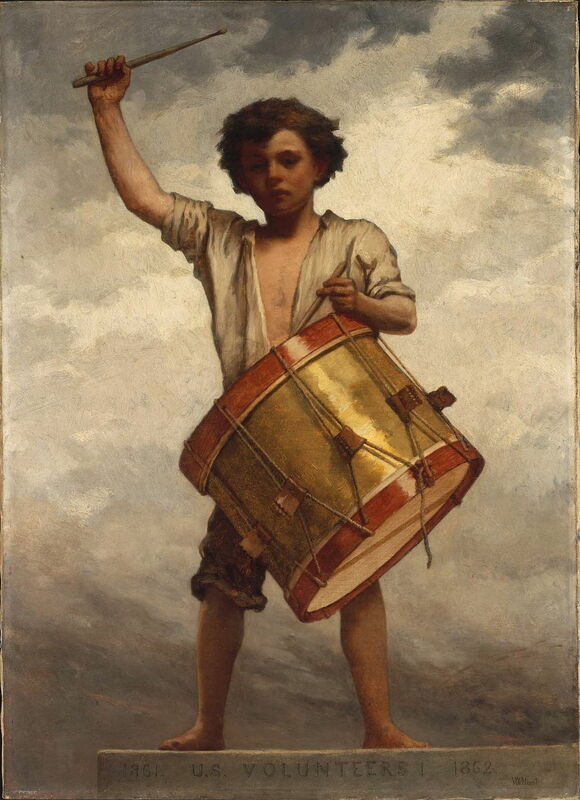 William Morris Hunt (1824–1879), The Drummer Boy (c 1862), oil on canvas, 91.8 × 66.7 cm, Museum of Fine Arts, Boston, MA. Wikimedia Commons. The outbreak of the Civil War was probably the motivation behind Hunt’s unashamedly militaristic The Drummer Boy (c 1862), confirmed by the inscription on the plinth below the boy’s feet 1861 U.S. VOLUNTEERS 1 1862. Behind him, the clouds are darkening with an incoming storm. William Morris Hunt (1824–1879), Italian Girl (1867), oil on canvas, 41.3 × 21.3 cm, The Metropolitan Museum of Art, New York, NY. Wikimedia Commons. 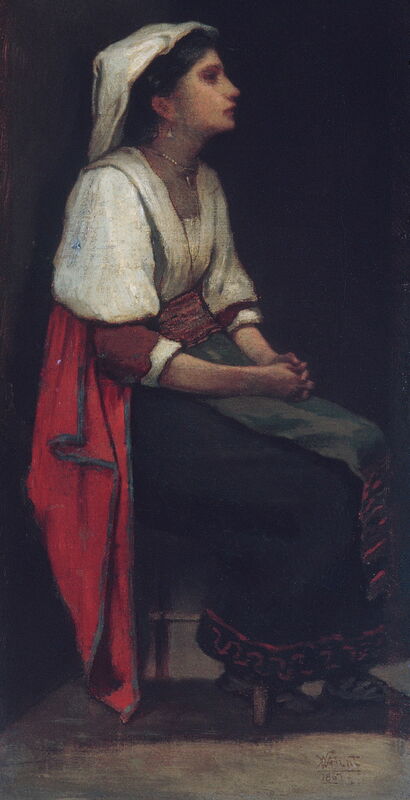 Hunt travelled back to Europe on several occasions, and it is likely that he painted Italian Girl (1867) and its companion boy during one of those visits. William Morris Hunt (1824–1879), The Ball Players (1871), oil on canvas, 40.6 × 61 cm, Detroit Institute of Arts, Detroit, MI. Wikimedia Commons. 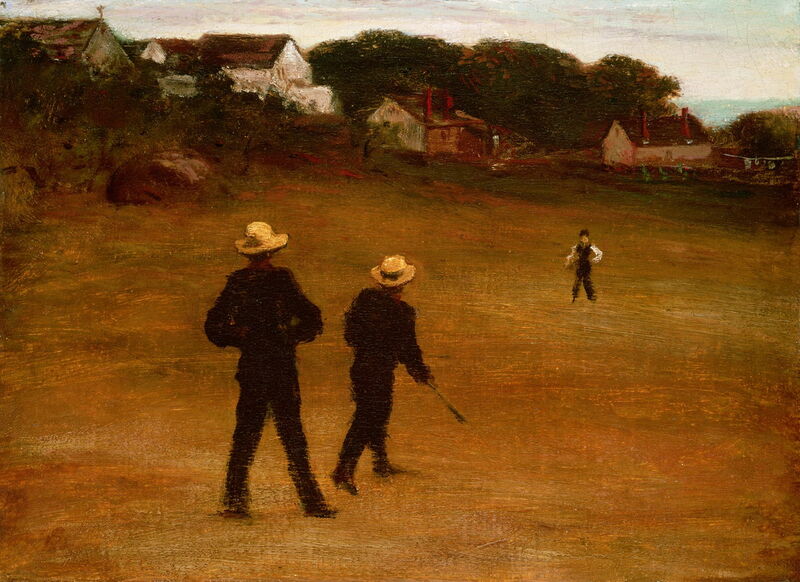 The Ball Players (1871) shows three men playing baseball on a rough field. It was painted in the year that the first professional league was established, when the game was growing rapidly in popularity, and seems to have been one of the earlier paintings showing the US national sport. After 1870, Hunt turned more to landscapes, where his loose style was particularly apparent. Those landscapes were a significant influence over the work of Winslow Homer, Childe Hassam, and others. He taught John La Farge and, until he decided to concentrate on his writing, William James. He also promoted the paintings of European artists, including his friend Millet. His writings on art were widely read. Among his circle in Boston were figures such as Ralph Waldo Emerson, Russell Lowell, Henry Wadsworth Longfellow, William James, and Erastus Brigham Bigelow, who was a founder of MIT. William Morris Hunt (1824–1879), Plowing (1876), oil on canvas, 97.5 × 142.9 cm, Chrysler Museum of Art, Norfolk, VA. Wikimedia Commons. 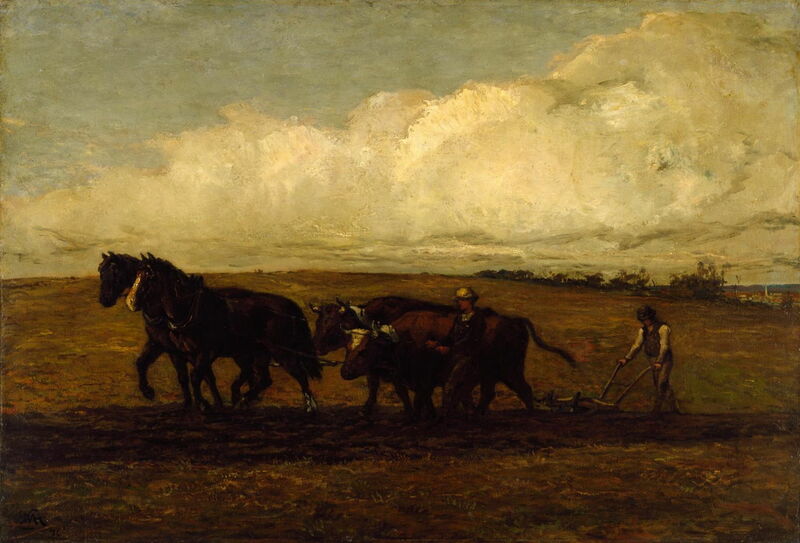 Hunt painted a few works showing farm animals and activities, including his Plowing (1876). The team shown is made up of two horses and two oxen, which was apparently not unusual at the time. This is one of his most overtly Barbizon paintings: tonal, relatively dark (although much of that may be old varnish), painterly, with predominantly earth colours. William Morris Hunt (1824–1879), Sand Bank with Willows, Magnolia (1877), oil on canvas, 61 × 106.7 cm, The Metropolitan Museum of Art, New York, NY. Wikimedia Commons. 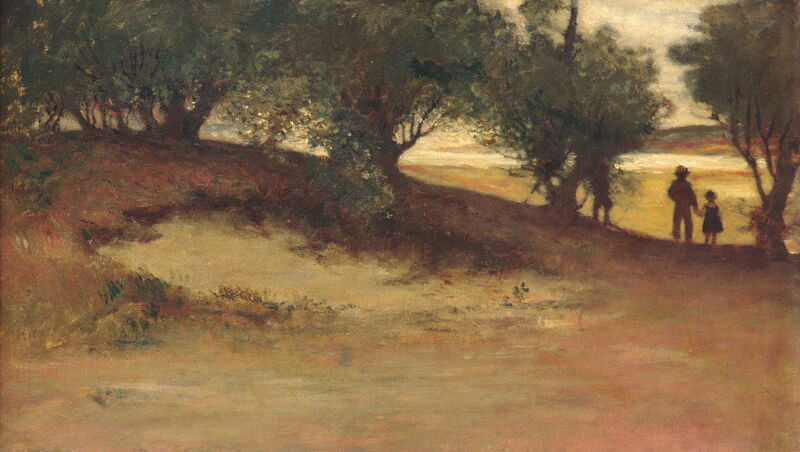 In other paintings, he appears to have painted more like Corot than Millet, as in his Sand Bank with Willows, Magnolia (1877). Although the landscape is hardly imposing, the young boy and his younger sister appear small in comparison to the low trees. There is another child to the left of that boy, apparently trying to climb the tree. William Morris Hunt (1824–1879), Landscape (1845–1879), oil on canvas, 38.2 × 61 cm, Worcester Art Museum, Worcester, MA. Wikimedia Commons. His Landscape remains undated, but was probably painted during the 1870s. 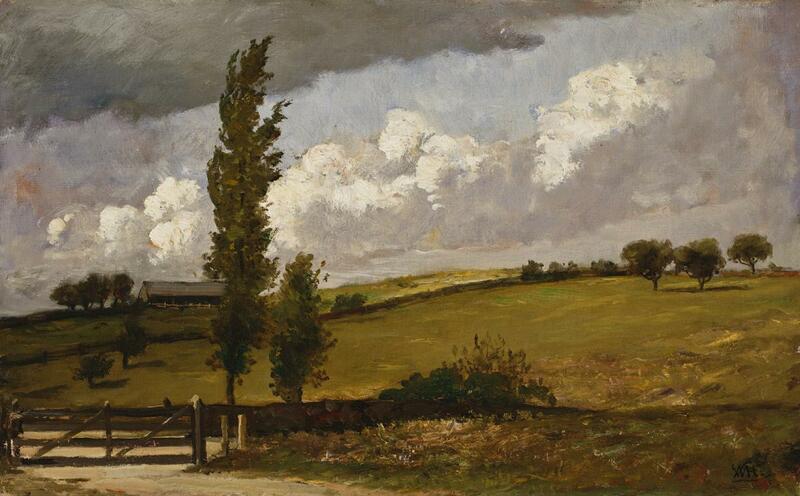 Although his marks are very gestural, and the cloud banks rich in brushmarks, it is still tonal with muted colours. William Morris Hunt (1824–1879), The Bathers (1877), oil on canvas, 96.5 × 63.5 cm, The Metropolitan Museum of Art, New York, NY. Wikimedia Commons. In 1877, Hunt painted two subtly different versions of the same motif, and produced an engraving: The Bathers (1877). This is the slightly larger version now in the Metropolitan Museum of Art; the other version, now in Worcester Art Museum, is shown below. Like other painters at the time, Hunt had trained himself to be able to paint entirely from memory, something which was popularised in several books and courses in the 1800s, before photography became commonplace. 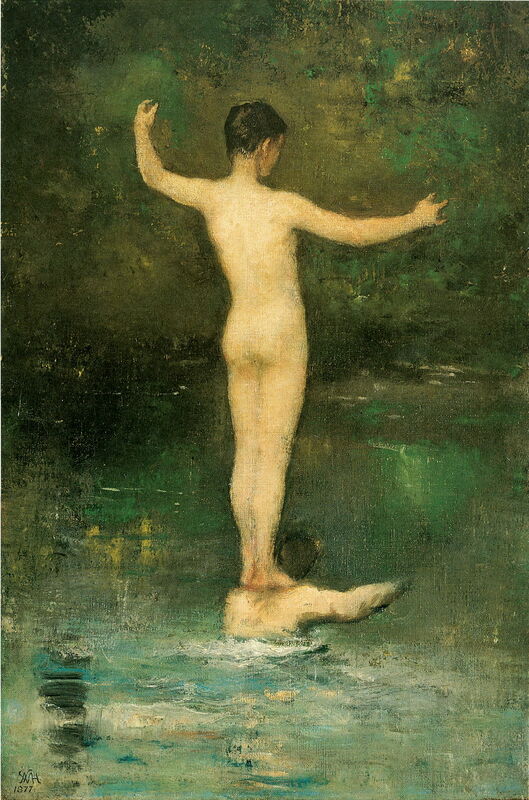 According to Helen M Knowlton, Hunt’s biographer in 1899, he was driving past a cove on the Charles River one day when he saw two young men in the water. 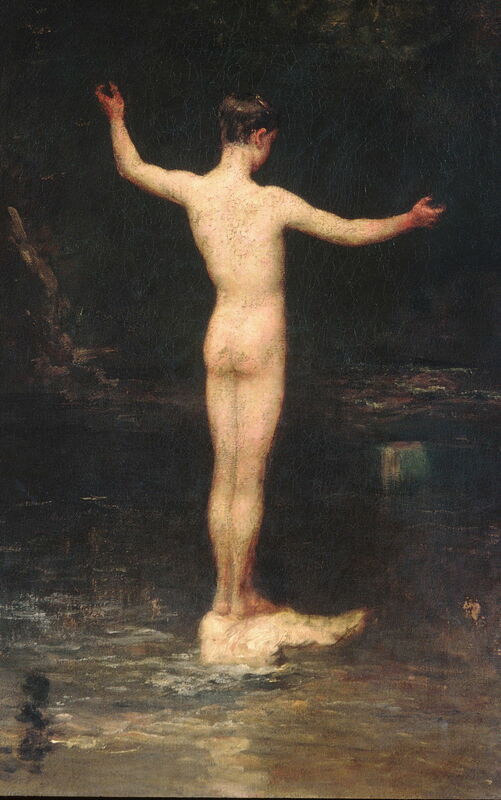 One, his feet apparently on the bed of the river, had the second standing on his shoulders, naked and ready to dive into the water. Hunt drove back into town, made a charcoal sketch from memory, then later completed the two substantial paintings of the scene. William Morris Hunt (1824–1879), The Bathers (1877), oil on canvas, 86.4 x 61.8 cm, Worcester Art Museum, Worcester, MA. Wikimedia Commons. William Morris Hunt (1824–1879), Winged Fortune (study) (1878), oil on canvas, 252 × 159.5 cm, Cleveland Museum of Art, Cleveland, OH. Wikimedia Commons. In the late 1870s, Hunt was commissioned to paint murals in the New York State Capitol Building at Albany, New York. 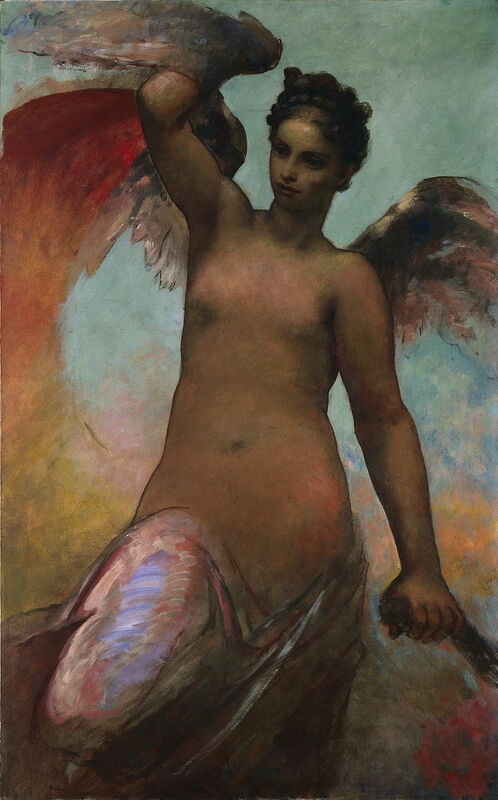 Winged Fortune (1878) is a study which he painted for the figure of Fortune, within those murals. Although only a study, Hunt has exercised great care in the flesh, and has used high chroma colours elsewhere. The Capitol was constructed over a protracted period between 1867 and 1899. In the end, Hunt only completed two, named The Flight of Night and The Discoverer, each about 15 m in length, and painted directly onto the sandstone wall of the Assembly Chamber. They unfortunately became damaged by moisture, and started to flake. Then the chamber’s vaulted ceiling was found to be unstable, and had to be lowered to cover them. 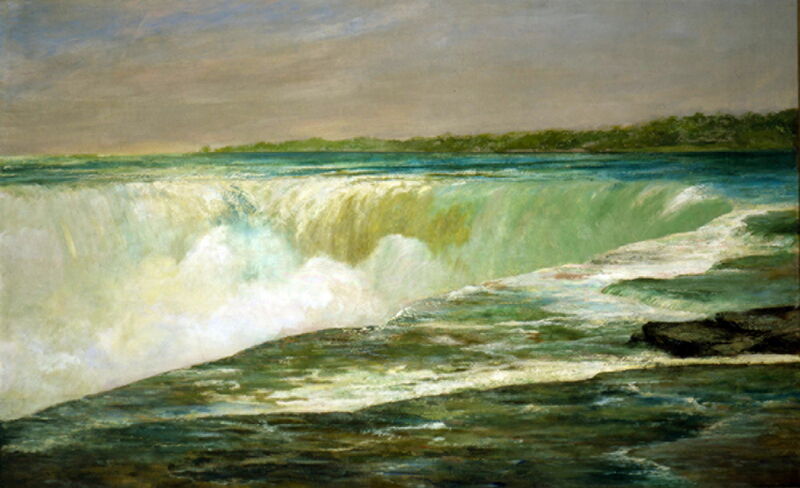 His last and greatest landscapes are views of the Niagara Falls (1878): this is probably the most famous of those, and shows the Canadian Horseshoe falls from the Canadian side, a view almost identical to that of Frederic Edwin Church in 1857. William Morris Hunt (1824–1879), Niagara (1879), casein on canvas, 158.1 × 253.4 cm, Museum of Fine Arts, Boston, MA. Wikimedia Commons. Niagara (1879) was painted from the other side, and is unusual in that Hunt used casein paints rather than his customary oils. Casein paints use the milk protein of that name as their binder, making them a distemper using water as the diluent. They dry as quickly as egg tempera, but can be reworked for a period until the binder has fully hardened. They were very popular among commercial artists until the advent of acrylic paints in the late 1960s, and underwent periods of popularity among fine art painters too. In his later years, he suffered from depression (bouts which were almost certainly a part of bipolar disorder), and when he died at the Isle of Shoals, New Hampshire, it was believed to have been suicide. In addition to strong collections of his work in the Boston Museum of Fine Arts and the Boston Athenaeum, significant paintings of his are in the Metropolitan Museum of Art, the Louvre, the Musée d’Orsay, as well as most other major collections in the US. Posted in General, Painting and tagged Barbizon, baseball, Boston Brahmin, casein, Civil War, Hunt, Impressionism, La Farge, Millet, painting. Bookmark the permalink.